1. The author has pulled back the curtain on the magazine industry and the portrayal reveals back-stabbing, superficiality and greed. Which industries in America do you think have similar corporate cultures? Do you think that the magazine industry is worse than, say, academia? Financial institutions? A place where you’ve worked? 2. Do you think there’s anything Magnolia could have done to persuade her boss not to turn Lady into Bebe? 3. 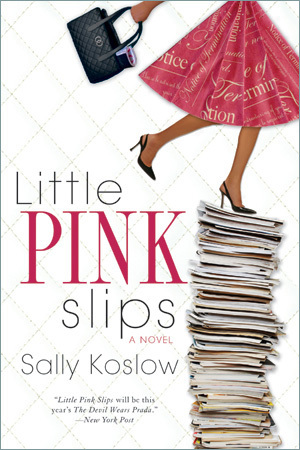 Little Pink Slips reflects on the extent to which celebrity mania infiltrates American society. We often know more intimate details about stars than we do our best friends. Why do you think this trend has taken root in the United States? Do you feel it’s innocent or damaging? What could reverse this trend? 5. On her talk show, the Bebe Blake character sandbags a guest, Sharon Stone, on a political issue. Do you feel that it is appropriate for celebrities to take a political stand? How do you feel about celebrities endorsing Presidential candidates and trying to influence elections? 6. Magnolia Gold, Little Pink Slips’ heroine, is a small-town girl who dreams of bright lights and the big city. Do you think that Magnolia would behave any differently if she were born in an urban area? What are your personal biases about different regions of the United States? 7. Was there a character in the book to whom you could relate? 8. If you were Magnolia, would you have quit rather than try and work with Bebe? 9. When Magnolia is promoted to corporate editor, should she have quit and not held out to be fired and receive severance? What would you do in such a situation? 10. Magnolia’s love life is rocky, and even at the end of the book, her romantic future remains unclear. Do you think that women in powerful positions have a harder time than other women in building relationships? Do you think men shy away from such women? If so, is this changing? 12. Do you feel American magazines have improved/deteriorated in the last ten years? 13. Do you read magazines? Why or why not? If you have a favorite, what is it and why? 14. What do you think of women’s magazines in general? If you were an editor what changes would you make? 15. If you could start a magazine, what would you name it and what would it contain? 16. Magnolia has a fling with an old high school boy friend. What is there about teenage boyfriends that mature women can sometimes never get over? 17. Magnolia helps her friend Abbey write a personal ad? What kind of a personal ad would you write for yourself? 18. Did you feel that the friendship between Abbey and Magnolia realistically captures a friendship between two American women today? What qualities do you think are important for close female friendships? 19. Did you get a kick out of Bebe? Despise her? When celebrities do outrageous things, do you suspect that much of their behavior is calculated simply to grab headlines? 20. Do you think the judge in the book made the right call? If you recall the trial between Rosie O’Donnell and her publishing company, do you think the judge ruled correctly in that case? 21. One reviewer of Little Pink Slips called Magnolia “passive-aggressive” for allowing Bebe to go ahead with a special issue on abortion, knowing it would not be a success with advertisers. Do you agree with that assessment or think Magnolia was being shrewd? Did this behavior make you like or dislike Magnolia? 22. If you were Magnolia, would you have quit your job at the end of the book and moved to Los Angeles to be with Cameron? Would you have written the ending differently? 23. The author says that she wrote this book to try to show personal resilience and get over a disappointment—in her case, losing a job. What have you done in your life to bounce back from a stressful situation? 24. In Little Pink Slips Cameron says to Magnolia “even if all gentlemen do is reflect on their tiny penises and ample love handles, what we write is called books. Got that? Literature. Even if the title is The Unibrow Diaries.” Do you consider the categorization of “chick-lit” a put down or fair?